Crochet Art | Kraft durch Häkeln ! 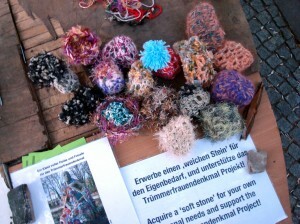 On Friday 1st May in Berlin-Kreuzberg, small cobblestones – traditional fodder during 1st of May Kreuzberg riots – were made ‘soft’ through crochet. The action took place during Kult im Bullenwinkel / Myfest, within the framework of the 1st International Printer and Performer Festival.